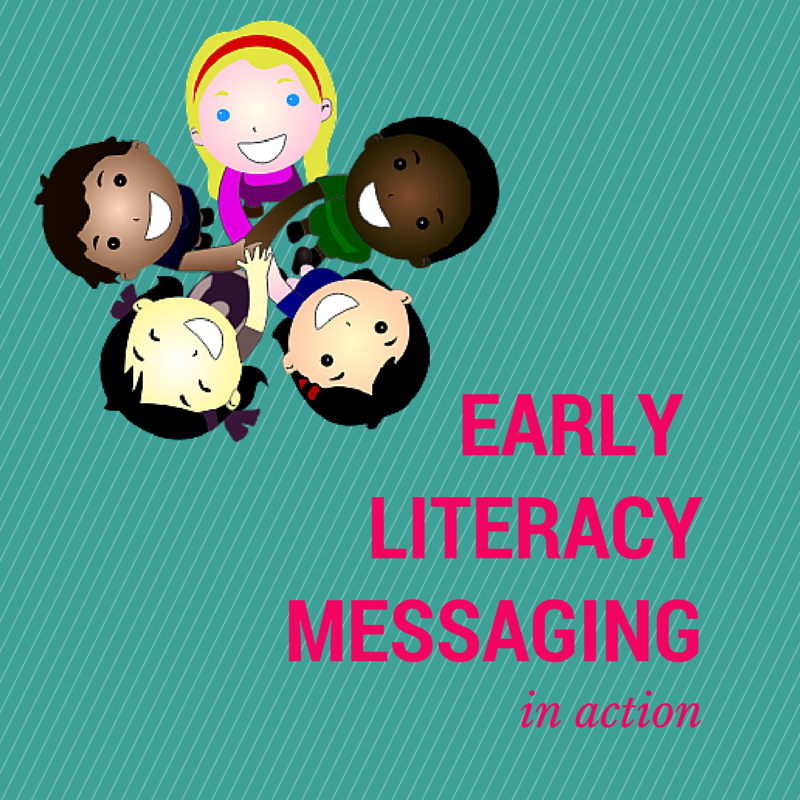 This week, I’m so excited to be a part of a blog tour on early literacy messages in action. Follow #EarlyLitInAction on twitter for more posts and a tour round up will be posted on Jbrary Friday, June 19th. I’m hoping to be more conscientious about showing the process of how I do and learn things. Sometimes I feel like we see these finished programs or ideas others are doing and we forget that the person didn’t just come up with a fully formed, perfect program that sprang from their brains. Learning is a process. So, I went back and looked at my first storytime plans. Dang. DANG! First of all, July 18th will be my 3 year anniversary of providing storytimes. I feel like I still have so much to learn and I’m just getting started! Secondly, I remember well how painstakingly long it took me to plan. I so did not do a parachute with balloons at my first storytime. But I had visions of grandeur. Note the lack of an early literacy tip on the sheet. I used to be all about themes. It helped me organize the transitions and structure. Early literacy messages were something I did, but it felt separate from storytime. It felt awkward, but I knew the information was important to communicate so I did it. I would type out exactly what I was going to say for each step and virtually read it from my storytime plan. And most of the tips I borrowed directly from Saroj Ghoting-an early literacy guru. As I continued to learn about the 6 early literacy skills, I started understanding them better and when ECRR2 came along with the 5 practices, things clicked for me in regards to how I could talk to caregivers more naturally. When I realized I was spending what seemed like a ridiculous amount of time trying to find a book or song or rhyme to match my theme, I ditched them. The time I had spent trying to find that perfect book/song/rhyme, I now spend learning more about child behavior and brain development as it relates to early learning. This has changed how I plan and communicate early literacy information to caregivers in storytime dramatically. Every single thing I include in storytime is intentionally there to support early literacy skills and practices. I don’t share every single thing every single time because my storytimes would be an hour long if I did! But I do make a point of sharing at least one thing at every session. I am genuinely excited to share new-to-me information with caregivers. I went to a wonderful workshop at the Kent District Library (that’s a link to their Play-Grow-Read portion of their site which is a wealth of tips and information!) where I learned that when we start counting with our thumb first instead of our index finger, we’re strengthening the first three fingers of our hands which are the one’s we need to be strong in order to write. I started learning about crossing the midline and how it helps make connections in our brains that will help us get ready to read. I’ve been introduced to Mind in the Making and the executive life skills kids need in order to achieve their goals. I’m currently obsessed with Fred Rogers who was a pioneer in child development. I am a huge fan of Early Childhood Investigations webinars. The Colorado Libraries for Early Literacy website is a treasure trove of information. And my to read pile is enormous (aaaand it just got bigger thanks to this awesome list from Jbrary!). And you know what? My caregivers seem genuinely excited to hear why I’m doing what I’m doing. Before and after storytime, I’ll frequently have caregivers come and ask me specifics about what I shared and I love encouraging them to explore the resources I’m using. I could go on and on and on and on about this, but I wanted to end with the reason I love sharing early literacy information in storytime: the why. When I learned what an enormous impact public libraries could have on our communities if we shared what we know about early literacy and learning, I knew I had found my calling. While reading, singing, playing, talking, and writing with under 5s may seem like common sense to us, there are so many people who do not know HOW to do these things with the children in their care. I have had caregivers with masters degrees thank me for showing them “how” to interact with their infants. I have had daycare providers (some of the biggest unsung heroes, imho!) tell me that they learn more during one of my storytimes than they do during required training. When we share this information with caregivers, we’re advocating for the youngest members of our society who are incapable of advocating for themselves while empowering their caregivers to do the same. I seriously could write another post about why it’s important advocacy for our profession-those who work with children-within our libraries to include early literacy messages in storytime because while, yes, storytime is hella fun, it’s incredibly important work that takes time to learn and execute. Our piece of the library budget can get bigger if we can demonstrate what we do in storytime is having a direct impact on caregivers and children in our communities (and if anyone can figure out a way for us to actually conduct long term research within our own libraries, I’m IN!). But for now, I encourage you to find your voice in early literacy messages. Be yourself. Be confident that the knowledge you are sharing is important. Because it is. And on that note: I’m off to my first storytime after a long break and I’m so excited to share with everyone what I’ve been learning! Extremely well put, Erin! Thank you for including so many awesome resources. Thank you! This has left such a positive impression on me. I can’t wait to learn more tips to share with the folks who join me for storytime. Thank you so much for passing on your passion and getting me excited to drop the themes! This is exactly what I needed to hear. You’re my hero. When my coworker first read this post she said “Erin, you might inspire people to consider dropping themes and this could be HUGE for so many!” I AM SO HAPPY! That’s EXACTLY it, Bridget! If you know it and you love it, the rest of it will come. My experience has been that caregivers love to hear what I’ve been learning and reading!